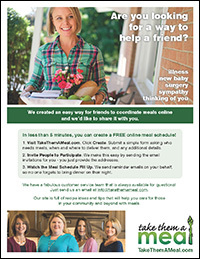 TakeThemAMeal.com is an online tool for coordinating the delivery of meals to loved ones. If someone is ill, elderly, or has had a new baby, oftentimes family, friends, co-workers, church members rally around these families to take them meals. In the past, one person would coordinate (by phone or email) the scheduling of the meals. Now, the meal coordinator can use TakeThemAMeal.com to allow the meal providers to sign up for the day or days when they will provide meals to the meal recipients. Is TakeThemAMeal.com a free service? Yes! Feel free to use it often, and tell your family, friends and co-workers about it. It is absolutely free! How are meals provided through TakeThemAMeal.com? Most meal providers prepare meals in their own kitchens or order local carryout/delivery for the meal recipient(s). We offer meals that can be shipped to the meal recipient if you live out of town or if you would like to have a meal delivered. Do I need to create an account to use TakeThemAMeal.com? We have tried to set up the site in a way that makes it very accessible. We do not require people bringing meals to set up an account. Anyone can access the schedule if they have the password or the direct link. Please know that our deepest desire is that friends would be able to help each other while using the site and we do not want to be a hindrance. Will meal providers be reminded of their upcoming meals to provide? If a meal provider enters an email address when they sign up to provide a meal, they will receive an email reminder the day before they are to provide the meal. I love to cook for others. Can you tell me of a recipient in my town who needs a meal? Unfortunately, we cannot match willing meal providers with meal schedules. We have not figured out a way to reduce the liability that could fall on the meal provider. If you know of a need, feel free to create a meal schedule and spread the word to your friends that you know someone in need of meals. Thank you for desiring to help others. Instead of bringing meals, I need to coordinate a lot of food for an event. Does TakeThemAMeal.com meet my need? We created another site, PerfectPotluck.com, that will help you with creating you meal plan. Who created and is maintaining TakeThemAMeal.com? Adina Bailey and Scott Rogers located in Harrisonburg, Virginia, created TakeThemAMeal.com. If you have comments, questions or suggestions, please send an email to info@TakeThemAMeal.com. I haven't coordinated a meal schedule before using your site. How do I get started? We're so glad you found our web site and hope it makes meal coordination simpler for you and your community. If you'd like to create a meal schedule, click on the 'Click Here to Create a Meal Schedule' link on our main page, TakeThemAMeal.com. Feel free to create a practice schedule to familiarize yourself with our site. Then, when you're ready, you can create a schedule for someone who needs meals. Schedules can be edited at any time. The Share via Facebook option allows you to share the schedule on your Timeline, Friend's Timeline, Group, Event, a Page You Manage or in a Private Message. The Send Text Message option, only available on mobile devices, allows you to share a meal schedule via text message. The Copy and Paste Schedule Link option allows you to copy the schedule link and paste it into your own email or website or message. The Send By Email option allows you to invite friends to the schedule via email. You can enter the email addresses into the 'Invite Friends' tool. The addresses simply need to be separated by commas or semicolons. Or, you can enter your own email address to receive an invitation you can forward through your own email system using your address book. We'd like you to use whichever method is most comfortable for you. Oops! I've forgotten my administrative password. What should I do? No problem at all. If you enter the wrong admin password, an option will appear to 'Click Here' and we will email you with a link to reset your admin password. Or, feel free to email us at info@takethemameal.com and we can help you reset the password if needed. What questions should I ask the meal recipient? Often, we set up meal schedules for those we know best - close friends and family. But what happens when there's someone in your life who you don't know very well, but could greatly benefit from a meal schedule - a new neighbor, an acquaintance in your moms group, a co-worker or member of your church? A Meal Recipient Questionnaire was shared with us, and we've made a few adjustments and additions over the years. We hope these questions will help guide you and make the process easier as you coordinate meals for those in your community. 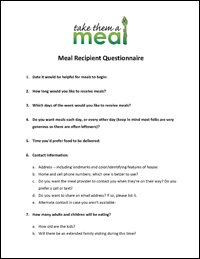 Download the Meal Recipient Questionnaire as an editable Microsoft Word document or a printable PDF. How do I edit my schedule? To edit your schedule, enter your administrative password in the upper right corner of the meal schedule. Then click 'Edit Schedule' in the gold bar. Scroll down to make any necessary adjustments. When you are done, click 'Submit Schedule Details' at the bottom of the page to save your changes. How do I extend my meal schedule? You can extend your current meal schedule by logging in with your administrative password in the upper right corner of the meal schedule. Then click 'Edit Schedule' in the gold bar. Scroll down and edit the 'Stop Meals' box. Be sure to click 'Submit Schedule Details' at the bottom to save any changes you've made. If you need to customize further the dates that fall between your start and end date, click 'Add custom dates' on the gold bar and 'Add' or 'Cancel' any date that falls between your schedule start and end dates. How do I add a link to the Notes section of a meal schedule (i.e. link to recipes or family blog)? Enter your administrative password in the upper right corner of the meal schedule. Click 'Edit Schedule' in the gold bar. Here you will see the page that you did when you first set up your meal schedule. Scroll all the way down to the last yellow box at the bottom where it says 'External Web Links'. In the first box, enter the web address. After you've added your information, click 'Submit Schedule Details' to save your changes. Your links will appear in your Notes section. How do I set up my meal schedule for more than one meal or need per day? You will want to use our 'Multiple Meals Per Day' function to schedule several meals per day. Meal coordinators will also use this feature to set up meals that will be prepared in parts (i.e. Main course, Side Dish, Dessert). To set your schedule this way, enter your administrative password in the upper right corner of the schedule's page. Then click 'Edit Schedule' in the gold bar. Scroll down to the box 'Days When Meals are Needed' and click the link for multiple meals per day. You can then name up to 3 fields per day (often used for breakfast, lunch, and dinner, but you can name the fields anything you need). When you are finished, click 'Submit Schedule Details' at the bottom of the page to save your changes. You should then see multiple slots per day on your schedule. If there are days when you do not need meals, you can click 'Cancel' on the far right of any date/meal that is not needed. How do I invite my friends to participate in a meal schedule? How do I invite friends who I've invited to prior schedules? If you've invited friends in the past using 'Invite friends', their email addresses will be available to you when you create subsequent schedules. If you want to re-invite friends to a schedule and you've already invited them to that schedule, you can click 're-invite' by the email address. How does your website work without requiring me to create an account? Our websites do not require accounts; rather you will be recognized by your email address. After you create a second schedule, when you are logged in as coordinator, you will have the option of accessing any of the meal schedules that you are coordinating. Also, when you create a schedule and use the same email address to create subsequent schedules, the email addresses that you enter in 'Invite friends' are recalled each time by your email address. So, when you create your second (or third or fourth) schedule, the email addresses that you entered on previous schedules will automatically appear in the 'Invite Friends' box and from there you can choose to use those addresses again or not. How do I view the most recent version of a schedule? Our website displays information in real-time. Any time you log in, you are viewing the most up-to-date information on the schedule. How do I invite friends using Facebook? You can share a direct meal schedule link on a Facebook page. By doing so, anyone who can view that Facebook page will be able to view not only the meal schedule, but also the personal information included within. If you are comfortable with this level of sharing, then feel free to share the schedule link. How do I let the recipient know about the meal schedule? Recipients do not receive an email notification about the creation of the meal schedule. Our desire is for the meal coordinator to let the recipient know a schedule has been created. However, if the meal coordinator enters the recipient's email address when creating the meal schedule, the recipient will be copied on all reminder emails. Reminder emails are sent the day before a meal is to be provided to the meal coordinator, meal recipient, and person who signed up to provide the meal. This email will show who is bringing the meal and what food will be brought (assuming the provider entered that information into the schedule) as well as a reminder of the details in the schedule (preferences, locations, etc.). If you'd like to invite the recipient of your meal schedule to see their schedule, you can provide them with a direct link to their schedule and/or the password to be able to log in at their convenience. You could also choose to a) copy and paste the schedule link into an email message or b) print the schedule using the link in the upper right corner. Keep in mind, however, that as the meal schedule changes, the printed copy may become outdated. How do I customize the dates on the meal schedule? If you'd like to hand select days of a schedule (for instance, if generally you are providing meals on M-W-F, but in one week, you'd like to have meals provided on T-Th instead), you will want to use our 'Add Custom Dates' feature. This feature is found in the gold bar when you are logged in with your administrative password. Just click the 'Add Custom Dates' link, then scroll down and click the 'Add' link (in gray beside any date not currently a part of the schedule). When you are done adding custom dates, scroll back up to the top and click 'Click Here' to save your changes. Does TakeThemAMeal.com accept international addresses? Yes! When setting up a meal schedule use the link labeled 'Click here for a non - U.S. address' to switch to an international address instead of a domestic address. Oops! I accidentally deleted a date from my meal schedule. How do I add it back? To add dates back into your schedule you must log in using your administrative password. Click 'Add Custom Dates' in the gold bar. Scroll down and, in the gray dates you've deleted, click 'Add'. Go back to the gold bar at the top and click where it says 'When you're finished, click here'. That will save your changes. Your dates should appear in the schedule again. How do I remove unwanted dates from my meal schedule? To remove dates from your schedule, click the 'Cancel' link on the date you'd like to remove (in green on the right side of your screen). If you need to change the end date of your schedule, enter your administrative password in the upper right corner of the schedule. Then click 'Edit Schedule' in the gold bar. Scroll down to the 'Stop Meals' box and you use the drop-down menu to edit the date that you would like meals to end. Be sure to click 'Submit Schedule Details' at the bottom of the page when you are done making your changes. The meal schedule I'm coordinating is very irregular. How should I proceed? Set up a schedule for a few meals per week for a few months. In the Note, let people know that the need for meals varies and that you will let meal providers know if you need to suspend the schedule. When the time comes that meals are not needed for a while, use our 'Send email' coordinator feature to let everyone who is signed up know that meals are not needed until further notice. Then, you can deactivate the schedule until you need it again. This will stop all reminder emails. When you know meals are going to be needed you can reactivate the schedule and pick up where you left off. Use the 'Send email' feature again to let meal providers know that the upcoming meals are needed. Finally, see if a few friends would prepare freezer meals that could be used in a pinch. You could keep the meals at your house and take them over when there is a last minute need, or you could make certain the family always has a meal or two on hand to use until you get the schedule going again. Gift cards to the hospital cafeteria can also be a nice gesture if they are spending a lot of time in and out of the hospital. I don't know exactly when my friend's baby will arrive. How should I proceed? Set a start date for the schedule by estimating the baby's arrival/due date. Ask two friends if they will commit to providing the first two meals on the schedule. One tip to make this easier is to have the friends prepare a freezer meal in advance so that it can be dropped off on short notice. Do not send out information about the schedule (or invitations through the site) until the baby is born. That way, you can adjust the dates once the baby is here and meals will come at just the right time. The two freezer meals help take care of the beginning of the schedule while the the rest of the schedule fills out. How do I end my meal schedule when people are still signed up to bring meals? Enter your administrative password in the upper right corner of the schedule. On the gold bar, click 'Send Emails' and select 'Everyone providing a meal'. In the box, compose a message letting people know that meals are no longer needed. After sending the message, click 'Disable schedule' on the gold bar. This will disable all the reminder emails as well. If you would need to access the schedule again, you will receive an email letting you know how to reactivate the schedule. How do I communicate with the people who are part of my meal schedule? We understand that once you've created a meal schedule, you may want to contact those you've invited who are providing a meal or those who have not yet signed up. To help you do this, we created a 'Send Emails' feature (can be accessed when you are logged in using your administrative password). Click the 'Send Emails' link in the gold bar, and select which of the three groups you need to contact. Then compose your message and click at the bottom to send your message. How do I thank everyone who provided a meal? When you are logged in as coordinator, click 'Send Email' in the gold bar. Select that you would like to send a message to everyone who provided a meal. This will open up a box where you can compose a personal thank you message that will be sent to everyone who provided a meal and entered an email address when signing up. How do I print out my meal schedule? To print a copy of your entire meal schedule (including previous meals), log into your schedule and click 'Show Previous Meals' where the meal dates begin. This will bring up the full schedule of meals provided. Then go to the top right corner of your meal schedule page and select the print icon. This will open and format your schedule in a new tab. Then, select 'File' and 'Print' from your web browser. How do I disable my meal schedule? If your meal schedule has finished, you can choose to disable it. This is not necessary since our system routinely removes inactive schedules. But, it is an option if you would like to do so. To disable your schedule, enter your administrative password in the upper right corner of the schedule's page. Click 'Disable schedule' on the gold bar. This will make the schedule unavailable unless you reactivate the schedule in the future (you will receive an email with a reactivation link). The information from past meal schedules is stored in our database for the convenience of our meal coordinators who frequently request the ability to refer to past schedules -- regardless of whether they have been disabled. The information is in a password protected database that can only accessed by TakeThemAMeal.com staff. And the only reason we would be accessing that data would be to re-enable a schedule for a coordinator. Why isn't a Google map link appearing on my schedule? The address will not display without the zip code because the site uses Google maps and needs that information to be able to display the map. To add the zip code, enter your administrative password in the upper right corner and then click 'Edit Schedule' in the gold bar. You can then add the zip code. Be sure to click 'Submit Schedule Details' at the bottom of the page to save your changes. If you know the street address is correct then that particular address is not yet available through Google maps. We see this now and then with new streets. I would recommend adding written directions for this particular schedule to the 'Notes' section. What emails should each person involved in the meal schedule expect to receive? The meal coordinator will receive a confirmation email including all the details pertaining to the meal schedule and the administrative password. If a meal provider enters an email address when signing up to provide a meal, they will get an email reminder the day before she/he is to provide the meal (the meal coordinator and meal recipient will be copied on this email). The meal recipient will not receive email notification about the creation of the meal schedule. Our desire is for a meal coordinator to let the recipient know about the creation of the meal schedule. Why am I not receiving reminder emails? You do not receive a copy of the reminder email when the meal provider doesn't enter an email address. The email is sent to the meal provider and you are copied on the email. Whenever the meal provider enters an email address, you will be copied. You also may not receive a copy of the reminder email if the meal provider signed up after the reminder emails were already sent for the following day (between 5 am and 7 am EST). Thousands of people use our site every day to coordinate meals for others, so thousands of emails are sent out from our site each day. Because of this, some email providers wrongly identify us as SPAM and could be blocking our emails. When are the 'Invite friends' invitations sent? In almost all cases the invitations are sent out immediately, however, some email providers delay the delivery of email messages as a method of spam prevention. Messages are typically received by the intended recipients within several hours. I think my invitations aren't getting through to my friends. What should I do? Send an invitation to yourself and then forward that invitation through your own email system. If your friends regularly receive your emails then they will receive the invitation from you. How do I include meal providers who don't have a computer? We've tried to make the site easy to use, so someone who isn't on a computer that often won't be intimidated. The email invitation has a direct link, so in one click, the meal provider can see the schedule and select a date. If even that is too much to ask, you can sign people up as coordinator. You can sign up the people who call you and people who are comfortable signing up can do it themselves. Why do I need to fill out my coordinator information each time I create a meal schedule? Currently, we have a site model that does not require accounts, so coordinators and recipients can have easy access to the site. Coordinators are recognized by their email addresses, so as you create schedules, they are linked together. All your schedules can be accessed when you are logged in as administrator on any one schedule. Your 'Invite Friends' email addresses are also carried from schedule to schedule. A friend accidentally changed information on my schedule. Can I make editing only available to me? It's rare but deletions on schedules do occur. You can adjust a setting on your schedule so that only you (as the schedule's coordinator) can edit or remove entries. Using this setting still allows people to sign up themselves, but if changes need to be made to the schedule, you are the only one who can make those (when logged in with your administrator password). I'm changing my meal schedule start date, but it's not reflected on my schedule? You have correctly re-set your start date. However, the system recognizes that people have already signed up for dates prior to your new start date. So, they are still appearing on your schedule as a reminder for you to contact them and let them know that meals are not needed until your new start date. Once you've contacted these people, you can click 'Remove' on the schedule beside the dates that are no longer needed and your schedule will display with your new start date. Are my email and my friends' emails safe on your site? From time to time we may send an email to all past meal coordinators and meal providers if we have a particularly exciting TakeThemAMeal.com announcement. Aside from the (very) occasional update, we do not use the information for any other purposes. We do not give or sell the collected names, phone numbers or email addresses. Any exceptions to this policy of sharing your name, address or email address with a partner company will be done only with your permission. Is my meal schedule information secure? Your schedule will have a password. To access the schedule, someone will need that password from you or you will need to send your meal providers an invitation. Can I use TakeThemAMeal.com to plan a one day meal where many friends are bringing food? We created another site just for this purpose - PerfectPotluck.com. Help! I can't find the schedule. I've forgotten my user password. What should I do? No problem at all. If you received an invitation or signed up on the schedule, click the 'Need Help? Click Here!' link at the bottom of the yellow 'Find' box on our main page. After you've entered your email address, you'll receive an email message with the details of your meal schedule(s), including passwords. Or, feel free to email us at info@takethemameal.com and provide us with the recipient name and/or the person who is coordinating meals. Once we have that information, we can look up the schedule you are trying to locate and provide you with the contact information for the meal schedule. How do I sign up to take a meal once I've accessed the meal schedule? To sign up to take a meal, click 'Take' in green on the right side of the date you'd like to provide the meal. Several boxes will pop up for you to complete (your name, contact info, meal, etc.). Once you have completed these fields, click 'Sign Up' in the gray box. How do I edit or change my existing meal entry? To edit your existing entry on a meal schedule, click the 'Change' link on the far right side of your entry. Your current information will display in a gold bar. You can click in any of the boxes to edit the information you have previously entered. When you are done making your changes, click 'Update' and your changes will be saved. To remove your name from the meal schedule, click 'Remove' in green on the right side of the date you have signed up for. It will ask 'Are you sure you want to remove...?' Just click yes and you will no longer be signed up on the schedule. What emails should each I expect to receive? If a meal provider enters an email address when signing up to provide a meal, they will get an email reminder the day before she/he is to provide the meal (the meal coordinator and meal recipient will be copied on this email). You may be contacted by the coordinator at any point if there are changes or updates to the meal schedule. Does TakeThemAMeal.com provide the food? Our website is a meal coordination tool, making the sign-up process easier. Most of the people who use our website prepare a meal in their own kitchen and deliver it themselves. However, we know that's not always possible and so to help in those instances, we have partnered with a local cafe that makes a selection of meals and ships them via Fed Ex. You can find more information and place an order in our store. I need meals. Can I create a meal schedule for myself? While some people may feel comfortable creating a schedule for themselves and being the one to invite others to participate, other people are not. If you are comfortable acting as coordinator, feel free to create a schedule for yourself. However, if you would prefer the schedule be coordinated by someone else, consider who would best serve in this capacity for you (friend, relative, co-worker, church member, etc.) and then ask them to help you in this way. We have found that most people are more than happy to help, though not everyone thinks ahead to offer to create a schedule. You could even offer to create the schedule yourself but have their name and contact information listed as the coordinator so that when invitations are sent out, they are listed under the coordinator's name, rather than your own. How do I get meals to a friend (or a friend's family) who is in the hospital? Typically in this situation, we see a coordinator set up a schedule and the delivery location is the hospital. Friends who are bringing meals need to be instructed as to what heating options are available. In this case, it sounds like meals should come in a cooler and be a chilled meal or the meal should be delivered warm at a very specific time. There may be a kitchen in another part of the hospital that the family could use, so it would be worth asking. It's also helpful to remind people that meals will often not be eaten at a table, so avoiding 'messy' foods can be a good idea. Many hospitals offer gift cards to their dining facilities, so friends could contribute to buy a gift card. Someone did this for us last year and it was so helpful. I cannot edit or remove my entry. Help! Some coordinators prefer that all changes be made through them. So if the 'Remove' or 'Change' link is not present, contact the meal coordinator whose name and contact information appear at the top of the schedule's page. Must I order food through your site or can I prepare a meal in my own kitchen? The main purpose of our website is to simplify the meal coordination process for those who would like to provide meals to someone they know. While most people use our website to provide meals from their own kitchen, we know that that's not always possible. If you'd like to send a meal, our 'Send a Meal' page will have more detailed information to assist you. Can we put meal schedule links on our church website? You are welcome to post links to your church's meal schedules on your church website. Prior to doing so, you may want to consider the privacy of the information within each schedule. If you choose not to link to specific schedules, you can certainly link to our main page. You can find html code and widgets here. Another option is you could make the password the same for all your church schedules and on your website you could link to our site and put the last names of all the families needing meals. That way, people could log in using the same password every time. The password could be your church name or abbreviation. You could provide a contact person in case someone doesn't remember the password. What are some meal schedule set up tips for churches? An easy way to keep your church's meal schedules easily retrievable would be for you to make the password the same for all your church's schedules. That way, people could log in using the same password every time. Or you can also put your church name as the last name and keep the same password. That way, if someone enters your church name and your password on the front of our site, all the people with meals schedules at your church will be displayed. To make searching for your church's meal schedules simpler, you can enter the recipient's whole name in the first name field and then enter your church name in the last name field. Keep the password the same for every schedule. That way, someone can find all the possible recipients by searching your church name and the common password. When setting up a schedule, always enter the coordinator email address as the church office or meal ministry email. That way, every schedule that is created under that email will be connected. Second, when entering the recipient name, put your church name or abbreviation as the last name and keep the same password for every schedule. That way, someone from your church can find all your active church schedules by searching 'Your church name' and 'common password' on the front of our site. One great feature of our site is that accounts are not required for people who are coming to sign up. If you send out the invitation from the schedule, in one click, meal providers can be on the schedule and signing up. Another easy way to tell people about your schedules is by sending one of our invitations to the church office or meal ministry coordinator. If that person already has an email distribution list, the invitation can be forwarded to everyone who wants to help with meals. Please let me know if you have additional questions. We're happy to help along the way. We love for churches to use the site since we created the site to help our own friend and church. We also created PerfectPotluck.com at the request of our users to help with one day meals like memorial service meals and church picnics. That site might be helpful to you as well. Still have questions? Email us at info@takethemameal.com.